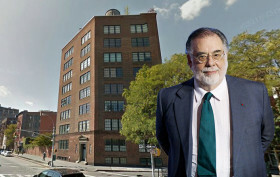 Famed director Francis Ford Coppola, responsible for “The Godfather” and “Apocalypse Now,” has picked up a $2.5 million apartment at 32 Morton Street, according to The Real Deal. The West Village address is the same building where Robert De Niro and his stepdaughter Drena bought a $2.8 million penthouse back in December. Coppola’s new loft has two bedrooms, 1.5 bathrooms, nine over-sized windows with southern and eastern exposures, and 11-foot ceilings. This will likely be a pied-à-terre for him and his wife Eleanor, as they own a vineyard and winery in Napa Valley.